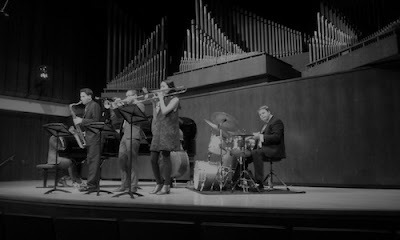 Juilliard’s Paul Recital Hall was where jazz drummer Douglas Marriner had his graduation recital on Monday, May 8th. From now on, and following a family tradition, Douglas, who is the grandson of the late English conductor/violinist Sir Neville Marriner and the son of LSO’s principal clarinetist Andrew Marriner, is entitled to an artist diploma degree, which authenticates him as a professional musician...with all the letters. The newly graduated envisioned different formations to tackle the six selected tunes he arranged for this special night. The sextet he summoned to join him on the bandstand had a three-horn frontline composed of David Neves on trumpet, Sam Dillon on tenor saxophone, and Kalia Vandeaver on trombone, and was rounded out with his mates from the rhythm section, David Meder on piano and Marty Jaffe on bass. The core of this group is from the Juilliard Jazz Artist Diploma Ensemble, with whom Marriner has worked for the past two years. They kicked in with Herbie Hancock’s I Have a Dream, whose lush harmonic progressions showed the way to the improvisers. Neves deployed trills, powerful high-pitched notes of variable duration, and motivic phrases, occasionally derived from melodies of known songs like Darn That Dream. In turn, Dillon revealed expansiveness, both in timbre and range, as well as fluency of speech. The first Monk composition, Thelonious, manifested its author’s unorthodox ways. Marriner injected a steaming Latinized groove with the help of Jaffe, giving it a vibrant, danceable touch. Marriner’s only original, Broadway Bounce, was delivered in trio, featuring pianist Micah Thomas, who sat in for Meder. Swinging along, the pianist hurled shifting chords on top of the steady rhythmic flow created by the drummer’s brushwork and the bassist’s pizzicato. The following piece, Harold Land’s Compulsion, was arranged for a trombone-less quintet engagement and spread colorful post-bop energy. Surprisingly, quieter atmospheres were reserved for the final round. First, through the classic ballad If You Could See Me Now, delivered in a traditional piano trio format, and then, through Monk’s Crepuscule With Nellie, in which the group was enlarged once again to a sextet. Douglas Marriner accomplished his mission with determination, thanking his teachers (Kenny Washington and Billy Drummond) and his parents, who were present, for the four years he spent at Juilliard, learning and being a better musician.